My wife and I took a trip over to Washington DC this past weekend, hoping to catch the first couple of Cherry Blossoms peaking out of their buds for some spring sunshine. We were in luck, because that is exactly what we got! We saw about 2 trees which were fully in bloom. They probably had the perfect amount of sun exposure, through the tall buildings, and just the right amount of root-warming from the sidewalks in front of them. They were gorgeous! I love cherry-blossom festivals, and the other spring flower festivals that happen all over the country! It’s a long drive home from DC. With traffic, it took us about 5 and a half hours, and the driving was not fun. Half the time we were cruising along, light traffic, good speed. The other half the time we were caught up in bumper-to-bumper, 25mph creeping traffic, on a 4-lane highway. And there is nothing I want more when I get home from something like that than some quality comfort food! I was seriously craving my White Wine Coconut Shrimp – but it was not to be… I was out of shrimp. Fortunately, I had a mixed bag of frozen wild-caught calamari and shrimp which I had been saving for just this sort of occasion! Start the Butternut Squash first. The whole meal takes a bit of preparation, but it’s worth every minute of it! First cube the Butternut Squash, put them on an oiled baking sheet (this is where you use the coconut oil) and lightly season them with the Italian seasoning. You may like to add salt and pepper to this as well, but do it for flavoring purposes, and keep it light and even. Put these in the oven on 250 for 60 minutes. After 35 minutes of bake time, start the Mashed Rutabaga. Chop this up as finely as you can stand and put it in a pot. With the rutabaga in the pot, fill with water up to the top of the rutabaga, add the coconut butter, and turn it on high. If the rutabaga is pre-chopped, start this process about 20 minutes before the butternut squash is finished, or after 40 minutes of bake time. Once the Rutabaga is cooking, start the Shrimp & Calamari. I used a 1 pound bag, and this was good for about 2 servings. Empty the bag in to a large sauce pan, add the seasoning and coconut butter, turn the heat on high and cook, covered, for 10 minutes. About 5 minutes before the Butternut Squash is finished, stir both the Shrimp & Calamari and the Rutabaga. Things are going to happen fast now, so keep on your game! Leave the Shrimp and Calamari uncovered. Now is the time when we want the liquid in the pot to boil off, leaving the coconut butter and the spices behind to stick to the shrimp and calamari. The flavor you will get from the coconut butter, the spices, and the wild-caught seafood is a great combination of the fresh, crisp seafood flavor with the thick rich flavor of the coconut butter and Italian seasoning. Mash the rutabaga at about 2-3 minutes remaining on the bake clock. You’ll want this to be pretty well mashed, so take your time. 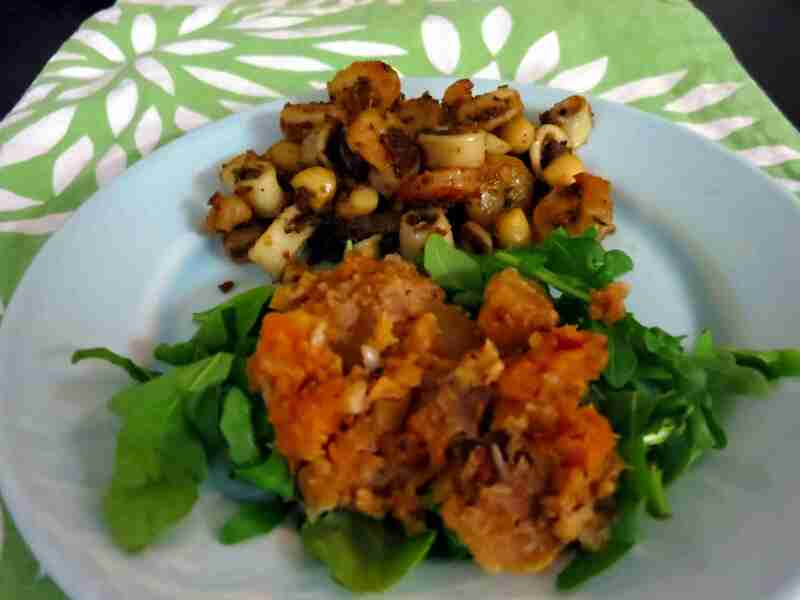 As soon as the Butternut Squash is finished, add it to the mashed Rutabaga, as well as the crushed walnuts, and stir thoroughly. Give this another 2-3 minutes of cook time before serving. While it’s in the final phase of cooking, make sure that the Shrimp and Calamari are being stirred regularly, and don’t get stuck to the pan. You can turn the heat down at this point, if it helps. And this is the time to get the plates ready, and put down the bed of Arugula. I know this is takes a bit of prep time, and it’s an involved meal to make, but trust me when I tell you: It’s worth it! As I said above: put the arugula down first. I didn’t put any dressing on the arugula. 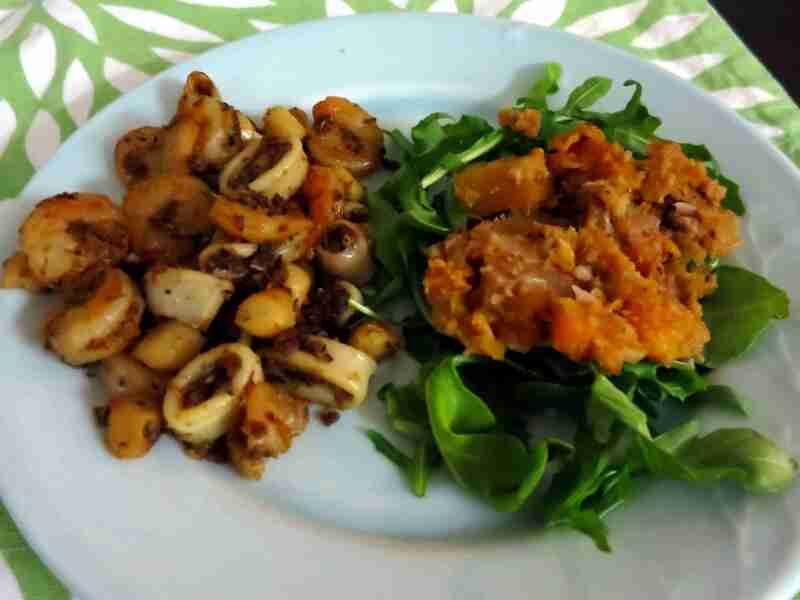 Now serve the rutabaga and butternut squash over the arugula, and the shrimp and calamari along side. And enjoy! For other “What’s For Dinner?” Meals, check back daily to Urban Paleo Chef! Great post. I love the step-by-step easy to understand instructions, combined with your art for telling the story! Thank you Jason – that means a lot to me! You are a master with recipe development and writing! And making me hungry! Thank you Carl! I am flattered… I really appreciate your comments!